After releasing his debut solo album ("Roman Candle") on Portland, Oregon's Cavity Search Records, Elliott Smith soon found himself drifting away from his power-rock alter-ego known as Heatmiser, and began concentrating on his solo stuff more and more. 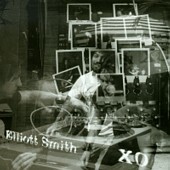 Following up ROMAN CANDLE with two more exceptional solo albums on Olympia, Washington's Kill Rock Stars, it wasn't until Smith earned himself an Oscar nomination that the spotlight hung directly overhead. Losing the Oscars to Celine Dion, all was not lost. Finding himself in the midst of a major label bidding war, he eventually chose Geffen subsidiary Dreamworks Records. Now with his major label debut hitting shelves, his knack for writing brilliant pop songs and deep, thought-provoking lyrics has been stretched even further. Starting off with "Sweet Adeline," Smith introduces himself to the listener with just his voice and the acoustic guitar. The guitar work is soft and fragile, but at the same time it is dark and mysterious. Smith's voice is the same way. You feel a lot of emotions coming straight from the heart, yet you never know how affected he is about what he is saying. A minute and a half into the song, Smith changes the pace to a full-blown pop song, complete with drums, bass, and a piano. The piano drips into the song with such beauty, while the drums rain steadily upon the snare and the cymbals. The acoustic guitar is still his weapon of choice, but with the complete band assembled (which Smith plays himself) he is able to elaborate on his words and really drive the melody deep inside your skull. "Baby Britain" starts out with just vocals and the piano, before other instruments soon slip in. A bouncy pop song, this is the type of pop that gets your head shakin' and toes tappin'. Smith's voice leads the song through gentle waters, causing tons of ripples. Very Beatles influenced, Smith's words separate the song from all the other Beatles-esqe numbers currently roaming around. His lyrics are deep, abstract at times, very complex, while also giving off a safe persona. At first glance you have a good grasp of what he is talking about, but soon you start analyzing another line and soon your idea of what the song is about changes. Not shallow whatsoever, his music is quite brilliant, but on top of his lyrics, any listener is a goner. "Independence Day" is yet another masterpiece from this gifted songwriter. Starting out with just the acoustic guitar, so gentle each pick of the strings feels and sounds if the guitar is crying, the drums soon come in and help push the song into the soft-pop realm. As the drums softly back the song, keeping everything steady and fairly bouncy, it is Smith's voice that warms the song and makes it a very memorable one. His voice has such perfect range. One minute he can be singing very harmonious, and the next moment he can be dark and angst-ridden, all while keeping his voice gentle and down to earth. As he once said, "There isn't anything I really need to scream," he clearly gets his message across with his shy, yet curious, voice. "Bled White," my personal favorite on this album, has definite top 40 ability. Right from the get go he uses the full 'band' affect, leaving you no chance to turn and walk away. From the opening chords of the guitar to the first notes the drums lay down, the song is as sweet as any apple pie grandma used to make. Very up tempo and full of lush vocals, this number shows Smith at his peak. Great drumming, tremendous vocal work, and powerful lyrics. "Don't you dare disturb me. Don't complicate my piece of mind," rings through the song with such passion that you can't help but understand where he is coming from. Singing along, Smith puts you in the drivers seat and allows you to feel his emotions through his intricate words and melodies. "Oh Well, OK" and "Bottle Up and Explode!" are a few of the tracks that mark the first time Smith has decided to bring in a string section to help add more delicacy to his already intricate formula. These strings, however, are not your average soft strings used on mellow tracks. Always one to make your heart pound with the intensity his music portrays, he uses the strings to add tension to the songs. Building on his words, the strings take it one step further and tense up your body as they flow through you and make you really feel an impact. Clever, they add a real important element to the songs. "A Question Mark" is the 'odd ball' of the group. A pop-jazz-funkish number, the addition of horns help re-enforce the already funky groove the song is centered around. A number that will rattle around in your heahe most natural of ways with just his voice. The charming lead vocals are nicely complimented with sweet, soothing backing vocals. Musical genius are not two words that go together quite often. A lot of musicians are quite great, and can crank out really great music, but most of them don't have the range, frequency, or intricacy that Elliott Smith possess. Voicing his angst, feelings, and emotions in a very delicate way, from beginning to end Elliott will have you captivated. Definitely one of the best records of 1998. I'll give it an A+.